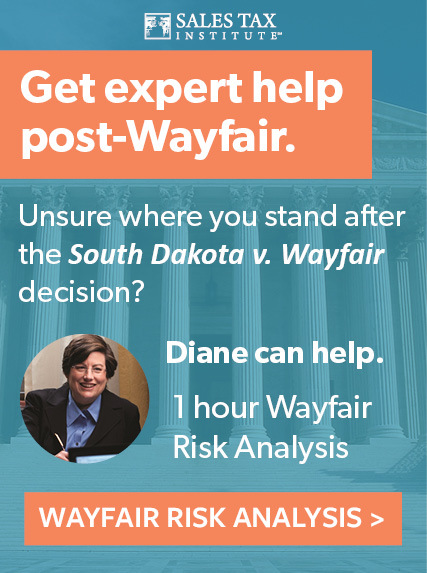 What do I need to know about the Wayfair case and economic nexus? What states impose sales/use tax? How do I know if I should be collecting tax in a state? Can you collect and remit tax for a state even if not required to do so? Does the Seller Collect Tax for the State It is Located In or the State Where the Customer is Located? How do Drop Shipments work for sales tax purposes? Didn’t the Internet Tax Freedom Act (ITFA) ban taxes on sales over the Internet? Why doesn’t the out-of-state retailer collect the tax? If you don’t have nexus and don’t charge sales tax, are you liable if the customer does not pay the tax? What is the Streamlined Sales Tax Project (SSTP)? How are contractors’ purchases taxed? Is a sales tax return required even if my tax due is zero? I am visiting from another country. Can I get a refund of sales taxes paid? Do states provide a list of what is and is not taxable in their state? I’m making sales over the Internet. Do I have to collect sales tax on all the sales I make? What are Sales Tax Holidays and how do they work? I Bought a Taxable Item and the Seller Didn’t Charge Sales Tax. Do I Have to Pay the Tax Anyway? What is Sales Tax Compliance and How Do I Do It? Sales Tax is defined as a tax on the sale, transfer, or exchange of a taxable item or service. Sales tax generally applies on the sale to the end user or ultimate consumer. Sales tax is generally added to the sales price and is charged to the purchaser. Sales tax in its truest definition applies only to intrastate sales where the seller and the customer are located in the same state. Sales taxes are considered “trust taxes” where the seller collects the tax from the customer and remits the collected tax to the appropriate taxing jurisdiction. There are different types of sales taxes imposed by the states. Some states are Seller Privilege Tax states while others are Consumer Tax states. This determines who is primarily liable for the payment of the tax. In Seller Privilege Tax states, the seller is primarily liable for the tax. The seller must pay the tax whether or not the tax is collected from the purchaser. The tax is generally imposed on the privilege of doing business in the state. Since the tax is not required to be passed on to the purchaser, it is not required to be separately stated on the invoice. However, most sellers do show the tax on the invoice. Under audit, the state can only collect the tax from the seller. In Consumer Tax states, the tax is imposed on the buyer with responsibility for collection by the seller. The seller is still required to remit the tax even if it is not collected from the buyer, but it is usually easier to recover the tax from the buyer. The tax is generally imposed on the privilege of using or consuming the products or services purchased. Under audit, the state can collect the tax from either the seller or the purchaser. Most of the states are considered Consumer Tax states. Use Tax is defined as a tax on the storage, use, or consumption of a taxable item or service on which no sales tax has been paid. Use tax is a complementary or compensating tax to the sales tax and does not apply if the sales tax was charged. Use tax applies to purchases made outside the taxing jurisdiction but used within the state. Use tax also applies to items purchased exempt from tax which are subsequently used in a taxable manner. There are two types of use taxes – Consumer Use Tax and Vendor/Retailer Use Tax. Consumer Use Tax is a tax on the purchaser and is self-assessed by the purchaser on taxable items purchased where the vendor did not collect either a sales or vendor use tax. The purchaser remits this tax directly to the taxing jurisdiction. Vendor or Retailer Use Tax applies to sales made by a vendor to a customer located outside the vendor’s state or sales in interstate commerce if the vendor is registered in the state of delivery.